The untimely passing of Supreme Court Justice Antonin Scalia has thrust the Supreme Court into the forefront of this year’s presidential politics. As envisioned by our founders, the Supreme Court could probably have been compared to a chihuahua. Its bark was strident and annoying, and it had small teeth that could cause mild pain but do no real damage. After all, real governance was in the hands of the individual states any of whom, theoretically, could refuse to comply with federal laws that fell outside the constitutional authority of the central government. With the enormous growth of the federal government, way beyond the framers’ original intent, the Supreme Court most assuredly has become the elephant in the room. Its decisions have a major impact on the property rights, lives, and freedoms of individual citizens. To the constitutionally challenged citizen, a Supreme Court with the awesome power to act as an arbiter of morality and social justice is the means to achieve any and all ends justified by its collectivist world view. To the constitutionally informed observer, however, it seems as if the Court’s recent history consists of periods of relative hibernation interrupted by sudden outbursts of activity during which the justices make numerous decisions that are devoid of any semblance of constitutionality. Of course, what can you expect if appointment to the court is based on political ideology rather than judicial honesty or constitutional wisdom. The Supreme Court’s constitutional authority most assuredly does not include acting in lieu of Congress and the Executive Branch or in substituting a modern interpretation for the words of our founders. The progressive left expounds that the Constitution is a living document that can be “modernized” at will. Since adhering to the Constitution prohibits most of its agenda, the left’s obsession with changing or ignoring clearly written law is not surprising. The Constitution is the written codification of our founders’ philosophy of individual sovereignty. While allowing for democratic choice in representation and leadership, it strictly protected the Natural Law Rights of the individual, those being life, liberty, property, and the pursuit of happiness. Those rights are granted by divine authority to the individual . . . not the collective. To read and understand the Constitution, all that one needs is knowledge of the English language and a dictionary from the 18th century to determine the meaning of the words to those who wrote them. Obviously, airplanes, automobiles, cell phones, and computers did not exist when the Constitution was written. Those devices, however, are no more than tools we now use to perform the same functions of life as our founders, albeit at a faster pace and in a more efficient manner. The Constitution deals with those yet unimagined scientific advances by specifying the principles by which we are to govern ourselves, regardless of the tools of our existence. Changing those principles and failing to protect and secure those basic rights by disregarding the written law, diminishes the individual freedom for every citizen and constitutes the theft of our birthright. In the mind of the libertarian constitutional purist, the Supreme Court does not actually have the right to interpret the Constitution. In fact, only the states have the legal authority to determine which actions of the federal government are constitutional and which are not. The sovereign states retained three powers to fight the usurpation of authority by the federal government: nullification, interposition, and secession. In spite of arguments to the contrary, the validity of each of these remedies was fully accepted by the framers. Historically, the use of these tools rarely succeeded. The failures are more correctly attributed to political and military issues than to the proper philosophy that places the sovereignty of states over that of the federal government, except for the enumerated powers listed in Article I, Section 8. Our Constitution is a contract among the states and their sovereign citizens. It created a central government with limited powers to perform only those specific functions that could best be performed by one entity for the benefit of all. The central government was the creation of the contract and not a party to it. Such a contract cannot be unilaterally altered or voided at the whim or decree of the entity created by the contract. The Supreme Court, unfortunately, has become a kind of “super legislature”, sort of a rich half uncle once removed, whose justices, not directly appointed and approved by We the People, nevertheless, make laws, rules, and regulations that affect every aspect of our daily existence. It is clearly legislation without representation . . . and clearly not as prescribed by the Constitution. By that construct, the biggest prize for executive and legislative branch winners in this year’s federal elections will be to choose enough Supreme Court justices and federal court judges to control the philosophical inclination of the nation’s judicial system for generations. In essence, your vote this November will determine if our nation will continue its slide into the abyss of statist tyranny or whether we have a small chance to reverse that trend and return to the constitutional republic we were given 230 years ago. Dr. Dan’s guest on Freedom Forum Radio this weekend is noted constitutional scholar Professor Robert Levy, Chairman of the Board of Directors at the Cato Institute. Robert joined Cato as senior fellow in constitutional studies in 1997 after 25 years in business. He is also a director of the Institute for Justice and the Foundation for Government Accountability. Robert Levy served as co-counsel to Mr. Heller in District of Columbia v. Heller, the successful Supreme Court challenge to Washington, D.C.’s, gun ban that was ruled unconstitutional. 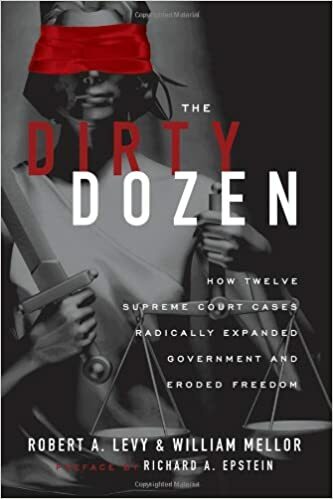 Robert’s latest book is The Dirty Dozen: How 12 Supreme Court Cases Radically Expanded Government and Eroded Freedom. The Dirty Dozen is a fascinating discussion of the twelve worst Supreme Court decisions of all time. Given the Court’s recent decisions, perhaps Robert will consider writing a sequel! Part one of this three-part interview airs this weekend, Saturday and Sunday, April 16 – 17, on WJRB 95.1 FM and streamed live over the Internet. Part two airs April 23 – 24, and part three airs April 30 – May 1. All programs are available by podcast following air time here. Please ask Mr. Levy his view on the COS movement to rebalance/restore state powers. Good article. Will send this out to those pertinent in my email addresses.